With a jam packed year behind us, this year as Christmas is fast approaching its the perfect time to plan ahead for our best Christmas Day yet. The kids are older now and are getting more excited about everything that Christmas is about. Not only will planning make the celebrations even more festive, it’ll give us more time to relax and enjoy the day together when it rolls around. It’s no secret here at Let’s Talk Mommy that we are constantly on the go. Here I’ve want to share with you seven elements that make up a really magical Christmas Day for everyone. Traditions are huge in our house now that we have our own kids. I love making new ones as they grow older and get more involved in the holidays. We bake Christmas sugar cookies together and spend hours decorating them on Christmas Eve as a family. We also always open one mini present from our stocking on Christmas Eve, it’s a tradition we did growing up and I now have carried it on to my own family. Even Mr P and I have a tradition to wrap all presents the night before Christmas and put them all under the tree, like a mini Santa’s work shop. Every family celebrates Christmas in a unique way. We all share common elements, but with little differences from country to country and house to house. There’s something comforting and reassuring about these little rituals and traditions, so why not try introducing some to your family whether it’s a walk after lunch, creating a signature mulled wine recipe or singing some karaoke at home, find something all the family can join in with and look forward to each year. 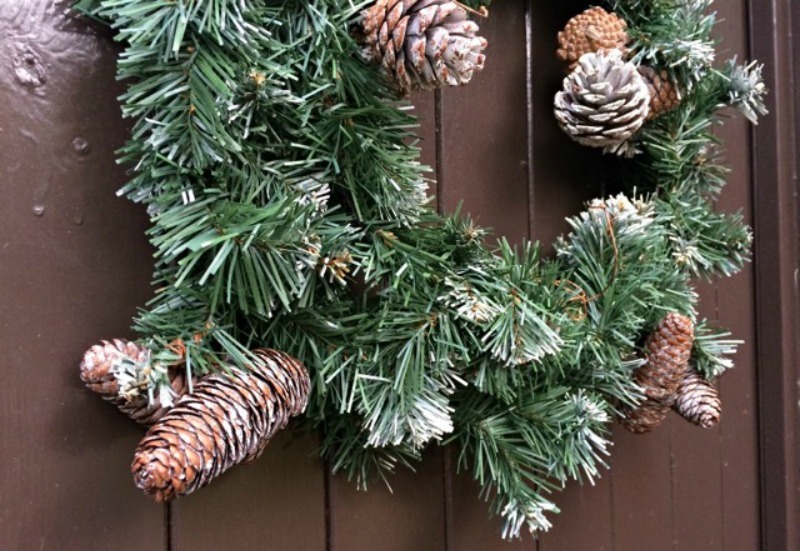 When was the last time you updated your Christmas decorations? The decorations above I have had for the last seven years and this year is the very first year I have branched out and added to my Christmas decorations. For many of us they stay in a box all year round and we whip out the same things each year. 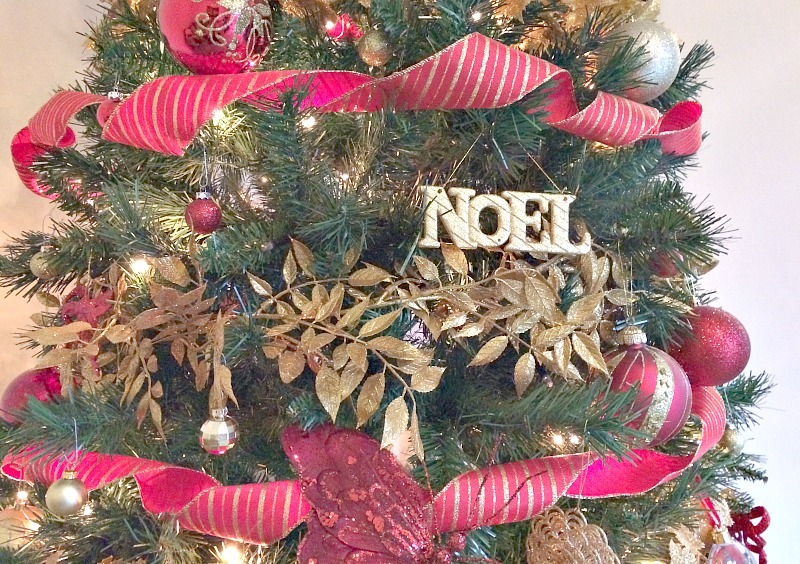 Of course, there is a real charm to our battered, handmade decorations, but why not try adding one new bauble or other festive accoutrement each year and start a family tradition! I have always had the Christmas tree decked out and a few bits here and there to decorate my house but this year is the first time I am looking for table decorations. It’s the first time I have thought beyond just our front room. We work so hard all morning baking it’s only right to do our culinary efforts justice by serving among a beautiful decorated table top. Have a peak Multiyork’s fabulous guide to dressing your Christmas table in style, I know I will be doing as I have no clue where to start! 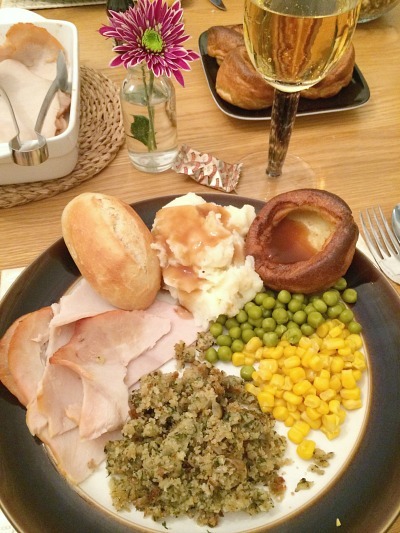 As an American expat living in the UK I am ever so lucky to get two turkey feasts back to back. One for Thanksgiving and one for Christmas. Whilst I love to have a huge yummy feast we do like to keep it simple for our two young tots. It’s easy to get swept away with festive bargains and deals at the grocery store and end up buying a huge hodge-podge of anything that takes your fancy. This year, plan ahead and decide exactly which favourite treats you want to get for you and your family and be realistic about portion sizes. Scrubbing up on your culinary skills is also a good idea. I know I am no chef so I have had a peak at some cooking guides like Donald Russell’s turkey guide to make sure this year I get the most flavor from our Christmas dinner. Now, drinks on Christmas Day don’t always need to be of the alcoholic variety, but what you drink can be just as special and delicious as what you eat. If you are opting for alcohol, then Christmassy options like mulled cider, or eggnog are ideal. 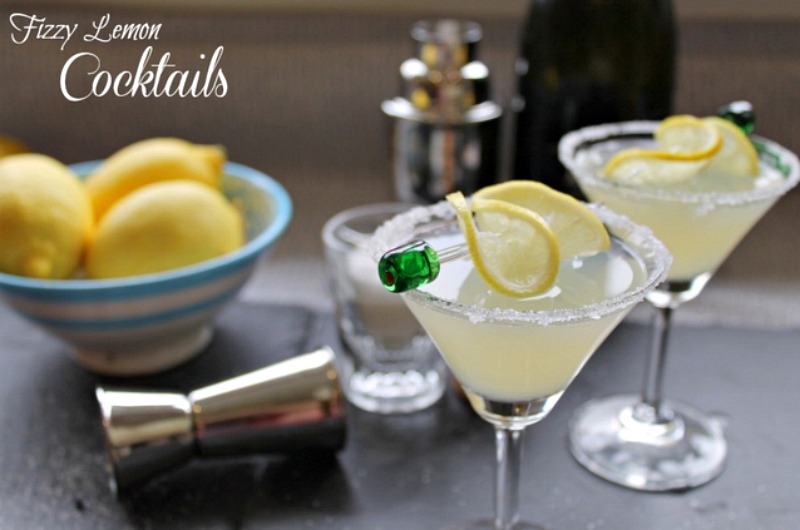 Even better try my famous recipe for Fizzy Lemon Cocktails like the ones above, they are brilliant for a festive drink or two. For kids try hot chocolate with mini marshmallows, warm milk with spices or flavored decaf Christmas blends of tea and coffee. For some, Christmas still holds it’s original, religious meaning and may attend carol services during the holidays, but even if you’re not religious, you can still find meaning in Christmas Day. It’s still a time when the world comes to a halt and we have a precious day to spend with family, at home and exchange gifts and kind words with those we love. Don’t let this get lost in the chaos. Taking a moment at dinner to thank everyone for coming is all it takes to reclaim the meaning of the holidays. Show your love and your kindness not to just your immediate loved ones but all your friends and family. For kids in particular, there can be a lot of time spent sitting around and waiting for dinner on Christmas Day. Make sure you’ve got in a TV guide, stock up on DVDs or get yourself a CD of Christmas tunes to play in the background. For after dinner, have some family board games prepared. Charades is free and fun. 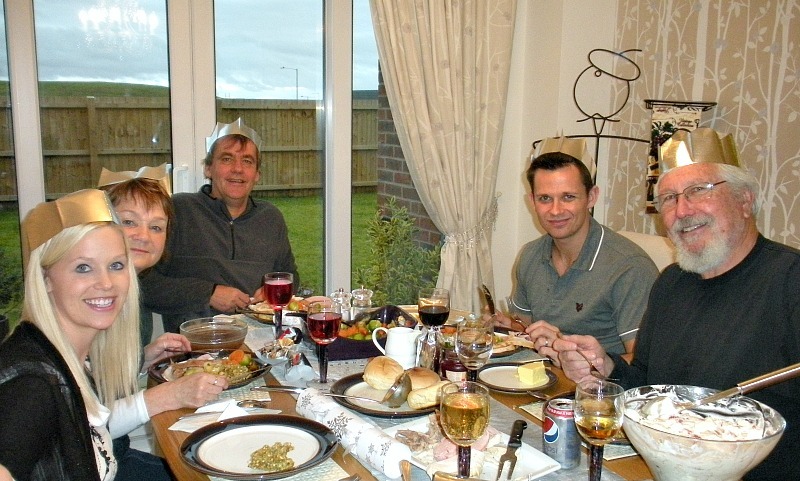 I have so many fond memories of games played after Christmas dinner with my huge family back home. It’s great to get all the kids involved to make them have as much fun as the adults. But this isn’t to say the adults can’t carry on playing long after the kids have gone to bed. Cards Against Humanity is a brilliant option for an adults only Christmas evening that’ll have you all in hysterics. If you’re lucky enough to be spending Christmas Day with your family this year, take a moment to consider people who aren’t so fortunate. I grew up lucky enough that our family Christmas Day’s were always full of friends and family surrounding us but I also had two years when I first moved away where I spent Christmas alone and it was heart wrenching. And I was only off to university there are those who aren’t able to join in the Christmas spirit at all, so taking time to offer up a small donation, help out at a local soup kitchen or join The Salvation Army’s Christmas present appeal and send a present to a child who will otherwise receive nothing this year can help spread the Christmas spirit that little bit further. You could even turn it into a family tradition that your children could carry on for generations to come. I think it’s so important to help those in need and to teach your children to do the same especially at this time of year. It’s not just about presents from Santa! So if you have had a busy year like we have here, get organized, plan your perfect Christmas Day with these helpful tips in mind. The more we prepare the less we have to do on the busiest day of the year. It gives us more time with our loved ones. Always don’t forget those less fortune than us, we should all be thankful and give back if we can! Let’s make this year a Christmas to remember! I know cheesy but true! That’s what the holiday season is really all about! For sure Donna. I agreed. I only wish my family lived in this country so each year is different for us. It’s true I think we can get really wrapped up into it. Hard not to but thinking of the bigger picture and helping others along the way too!